Handheld stop watch with neck strap. WATER RESISTANT. TACTILE FEEDBACK FOR BUTTONS POWERED BY 1PC 2032 LONGLIFE LITHIUM BATTERY. BIG, EASY TO READ LCD CHRONOGRAPH with partial and total elapsed times up to 9h 59’59”99, lap times. WATCH with alarm clock and Pacer dater. TIMER with COUNTDOWN function. 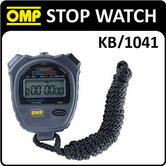 Description: Handheld stop watch with neck strap. WATER RESISTANT. TACTILE FEEDBACK FOR BUTTONS POWERED BY 1PC 2032 LONGLIFE LITHIUM BATTERY. BIG, EASY TO READ LCD CHRONOGRAPH with partial and total elapsed times up to 9h 59?59?99, lap times. WATCH with alarm clock and Pacer dater. TIMER with COUNTDOWN function.